The 2017 Mazda Miata RF, with 155 horsepower and the same fuel economy as the new car. 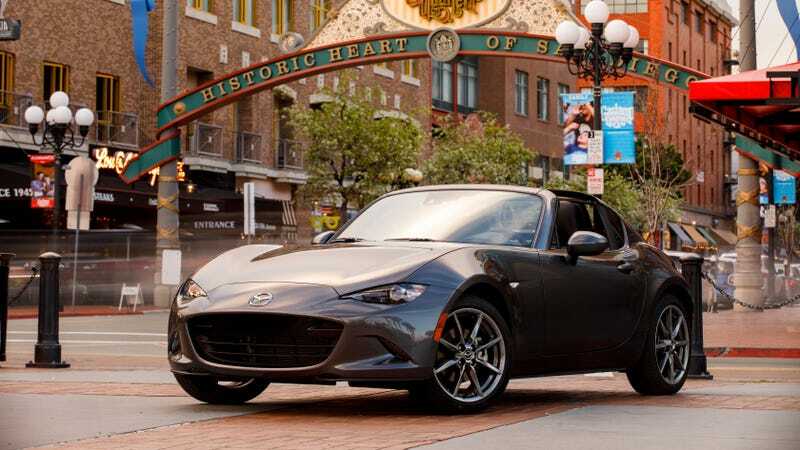 The 2019 Mazda Miata is Mazda’s answer to the prayers of the people—the prayers that start with “more power” and end with “amen, also please don’t forget the power.” The best part is, new fuel-economy ratings say the bump from 155 to 181 horsepower won’t cost more at the pump. The pump costs enough right now anyway, so that’s a really good thing. Torque News had the idea to find the hard numbers on the U.S. Department of Energy’s fuel-economy website, though. Ratings for the new Miata are out months ahead of it going on sale this fall, and the automatic 2019 Miata actually got better ratings than the 2018 model year did. No matter what conclusions the fuel-economy numbers and two-digit figure may lead to, a 26-HP bump on a car like the Miata is huge. It’s all about power-to-weight ratios, and the Miata’s meager curb weight in the 2,300- to 2,400-pound range means a little bump has a big effect on how powerful the car is. In addition to the 181 HP and 151 lb-ft of torque, Mazda said the new Miata got a redline bump from 6,800 rpm to 7,500 rpm and a telescoping steering wheel to let drivers move the wheel closer to and further from the dashboard. All of that for the same price at the pump, although probably not the same price at the lot. Sounds like a good deal—but maybe not a better deal than all of the price cuts dealers will put on the 155-HP versions to try to get rid of them.